Notes: Based on the manga by Tomita Sukehiro and Yazawa Nao, all of which has been released in North America by Viz. Hanasaki Momoko, Tanima Yuri, and Tamano Hinagiku are all best friends currently attending middle school. In addition to going to school (where the three pine for the soccer star Yanagiba Kazuya), the three also must protect Earth from the invasion of the devils, led by Rain Devila, who would like nothing more than destroy all traces of love, as well as collect the Saint Something Four, which will make Rain Devila very powerful. How do Momoko and her friends fight her off? By transforming into magical girls. And so, it's up to Momoko, Yuri, and Hinagiku to transform (respectively) into Wedding Peach, Angel Lily, and Angel Daisy, to fight off Rain Devila. This is the second time I've re-written my Wedding Peach review for this very review site. The original review was my first ever for the site, and at the time, I only saw the first 4 episodes. The sheer monotony of those first few episodes I watched back in 2002 almost turned me off from the series for good. Now we fast-forward to March 2004. 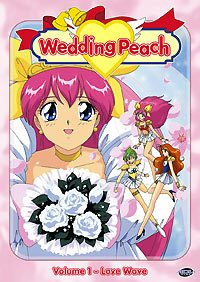 ADV had licensed Wedding Peach the year before, and was now distributing the DVDs. A few months later, the show finally lands on Anime Network, ADV's anime station that showcases their anime releases, albeit only in English (except for a small run of Japanese-language Neon Genesis Evangelion episodes). I decide to give Wedding Peach another shot. I re-watched the first four episodes, as well as the next two, and my opinion of the show did not change one bit. However, after I made it past the first 6 awful episodes, I noticed something; I was started to almost like this series. The one series that we practically poked at every day on the THEM Boards for well over 3 years..I was starting to enjoy it. Not really enjoy it, mind you, but more of a feeling of its acceptance in the realm of anime, much like I later got with Sister Princess (or head-honcho Carlos got with Digimon, to point to a more important authority figure). However, this does not mean I'm overlooking everything bad about Wedding Peach. Although character development becomes more apparent the farther you watch the series, these girls are still cookie-cutter stereotypes (bubbly, clutzy girl, book smart girl, tomboy), and I still find Momoko to be fairly annoying. However, the romance that buds between her and Fuuma Yousoke is noticeably less jarring than that of Sailor Moon's Usagi and Mamoru, and DOESN'T require a look into their past lives to realize they love each other, either. I also like it how the mascot, Jama-P, started off evil and turned good. While not an uncommon plot device in anime and manga, it IS uncommon for the mascot to go from bad to evil, or vice versa, so I guess some kudos go out to that. However, even a third into the series, not much is revealed about the head villain, Reine Devila. She seems to have multiple lackeys (much like Sailor Moon's Queen Beryl), and that she hates marriages and couples, but not much else is known so far. I fault the filler taking up so much time, but that's what Sailor Moon did too, so I guess I just have to either watch more, or wait for season two, to find out. One thing that's unique (or stupid, depending on your view) about Wedding Peach is that it takes its transformation sequences from Western-style marriage ceremonies, as opposed to vintage magical girl series. When Momoko, Yuri, and Hinagiku first transform, they first change into wedding dresses (each one different and reflecting of the girl's personality), and then again into battle armor. The reason for this? To store up love energy (I'm not joking). This sequence ends up taking two minutes of the episode, and is used almost every episode. Combine this with the stock animations for the girls' special attacks, and we've already lost 3 or 4 minutes of actual work an episode. The fact that Wedding Peach also spouts pledges defending love against the monster of the day (TM) makes it drag on longer, and makes you wonder what KSS does with the thousands of yen they save an episode by only animating 17 or 18 actual minutes of footage an episode. Well, "animate" may be too extreme in this case. Typical of almost all KSS works, Wedding Peach is poorly animated, with washed-out backdrops, average, inconsistent character designs that look little like the manga (despite even using Kazuko Tadano, character designer of early Sailor Moon), and faded colors make the series look like it hasn't aged well at all (or maybe it's just the masters ADV got. Can't really tell). The music is as half-assed as the animation; lame synthesizer music plays almost every time something happens, and even the opening and ending themes of the series are plagued by it. The voice acting isn't stellar in English or Japanese, though each language track has its perks (Ueda Yuji does a good job as Kyousoke, and Yuri's English voice is more pleasant and fitting than her Japanese one, at least in my opinion). That's about it. With a third of the series down, I'm kind of disappointed KSS decided to put in as much filler as it did, because those filler "monster-of-the-day" episodes give Wedding Peach its reputation of being a Sailor Moon clone, when it's infinitely more entertaining and satisfying when it stands on its own two legs (such as later on giving love interests for all three girls, unlike most magical girl team series since). As for now, I consider Wedding Peach to be an average series, nowhere near as awful when I first reviewed almost three years ago. However, only time will tell whether or not an update will come in the future (and yes, I do plan to review its OAV sequel, Wedding Peach DX). Recommended Audience: Fine for all audiences. Nothing objectionable whatsoever, though some little kids might get scared by some of the villainous mischief that occurs..